The United States Naval Academy has supplied our nation's military with highly skilled, well-trained officers for generations. Prior to World War II, the United States had a long tradition of not maintaining a large standing military. For this reason the nation's military academies were crucial to preparing an officer corps that could quickly train and deploy an effective fighting force to defend our nation. 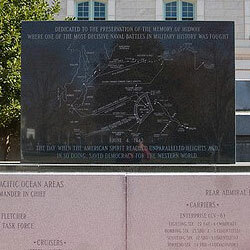 The United States Naval Academy served this purpose admirably in the months leading up to World War II and most especially after the Japanese attack on Pearl Harbor. Each of the pictures I have chosen represent a way in which the United States Naval Academy contributed to the development of the military leaders who led the United States to victory in World War II. 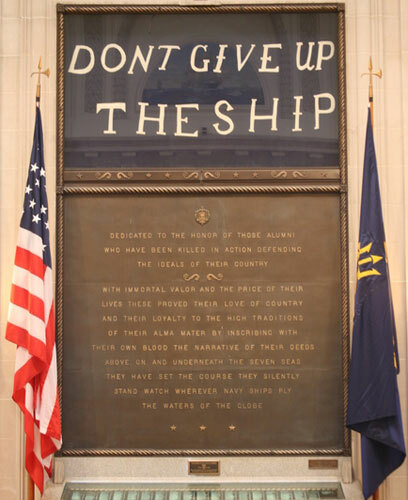 Whether it was training midshipmen to lead soldiers and sailors or instilling them with the fighting tradition that would carry them through the war, the Naval Academy significantly impacted the nation's war effort. With highly trained officers, the American Navy and Marine Corps were among the world's most capable fighting forces. 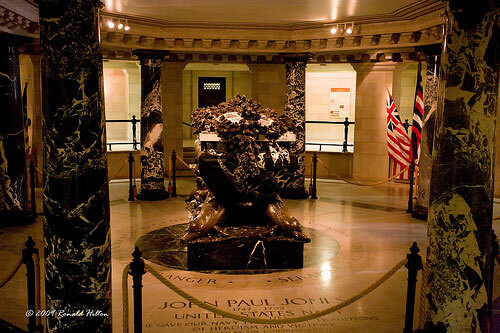 For my first two photographs, I selected pictures of John Paul Jones tomb and Commodore Perry's "Don't Give Up the Ship" battle flag. These images show the fighting tradition that was instilled in every Naval Academy graduate that went off to fight in World War II. 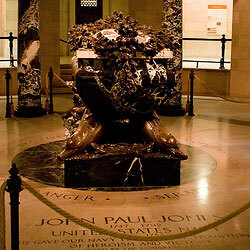 John Paul Jones is considered the United States first naval hero, and rightfully so. While engaged in a battle with the British warship Serapis, Jones uttered the famous words that would inspire every Naval Academy student. As defeat looked immanent and the Serapis asked for his surrender, Jones responded, "I have not yet begun to fight." He and his crew then overtook the Serapis in a great victory for the American Navy. His message to fight against all odds was drilled into every Navy man who trained at the Academy and it's one of the core values that guided our fighting men in battles around the globe. 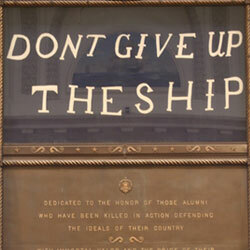 The "Don't Give Up the Ship" battle flag originates from the courageous efforts of Captain James Lawrence. Captain Lawrence had been mortally wounded in an engagement with a British vessel during the War of 1812. His dying command was "Don't Give Up the Ship." Though his crew was soon overwhelmed by the British, his dying command became immortalized in the Navy's fighting tradition. Next, I choose a picture of the Battle of Midway memorial because this battle was the crucial turning point in the War in the Pacific. The American fleet, which was commanded by Admiral Chester Nimitz, routed a Japanese task force heading for Midway Island and significantly weakened the Japanese fleet. 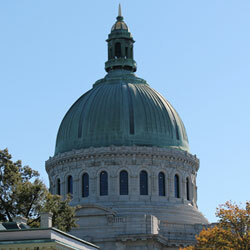 The battle of Midway was a crucial turning point because it put the Japanese Navy on the defensive for the remainder of the war and cost the Japanese military the cream of their naval aviator corp.
To broaden my story, I chose a picture of the Naval Academy Chapel because it represented a place of both joy and sorrow. Knowing they might be killed while serving their country, many Academy men married their sweethearts before shipping off to war. This ensured that their loved ones would receive their benefits if they were to make the ultimate sacrifice. Of course, the Chapel was also the sight of many funerals for those who had lost their lives in the service of their country. The Naval Academy is an institution full of monuments. 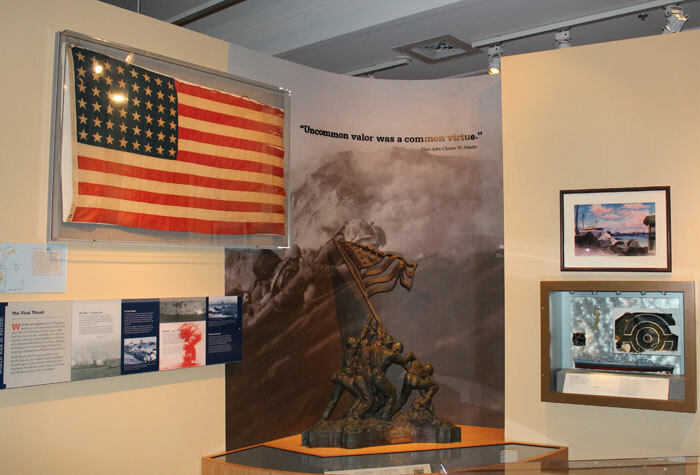 I chose the picture of the Iwo Jima flag raising monument because the taking of Iwo Jima, an important Japanese stronghold, was made possible only through the efforts of the United States Navy. The Navy provided the ships, amphibious vehicles, supplies, and personnel needed to take the island. A number of the men that led this key battle were Naval Academy graduates. 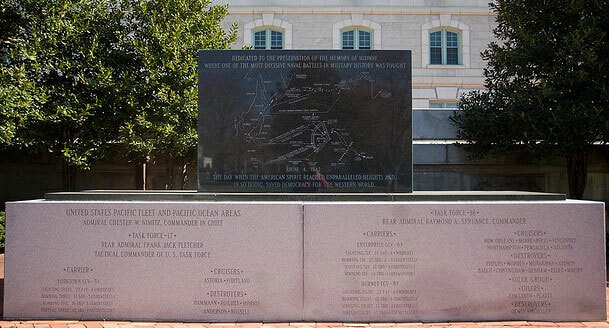 The battle was a long, hard struggle that cost many American lives. 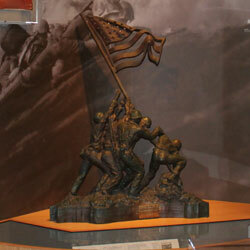 The quote located at the top of the display makes clear that on Iwo Jima, "Uncommon acts of valor were a common virtue." 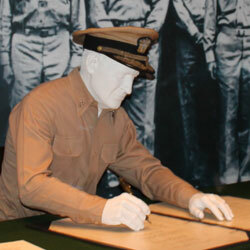 For my last image, I chose the picture of Admiral Nimitz signing the terms of the Japanese surrender. 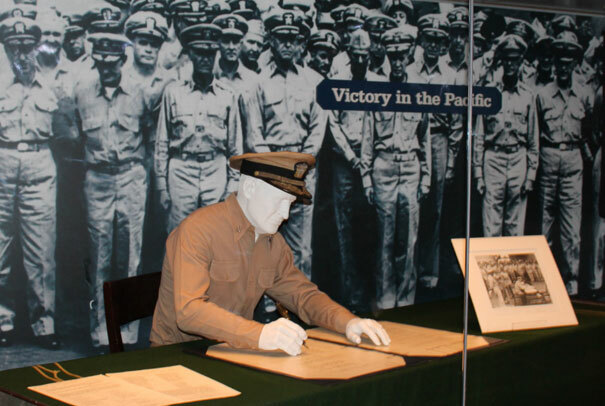 Nimitz, a Naval Academy graduate himself, led the American Pacific fleet throughout the war. The war in the Pacific was mostly a naval struggle. This is why it was only fitting that the instrument of surrender was signed on board the U.S.S. Missouri, a United States Navy vessel. 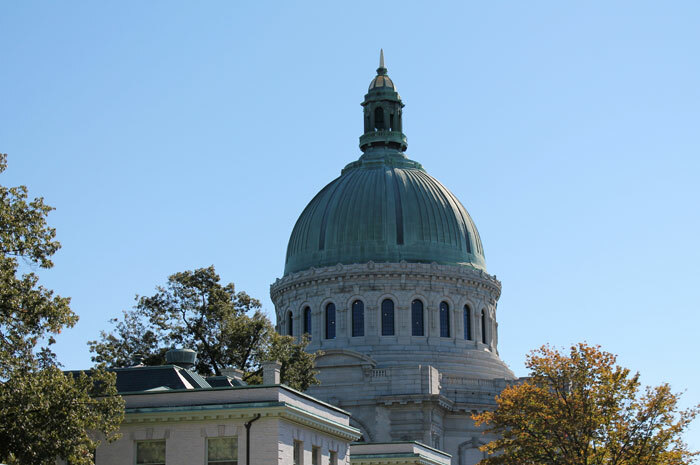 The United State Naval Academy played a crucial role in the American victory in World War II and Marylanders are proud of its contributions.